The world is a big place. At any given instant something is happening somewhere, but even when nothing in particular is going on people still find ways to generate data, such as posting on social media, taking photos, and issuing search queries. A substantial number of these actions is associated with a location, and in an increasingly mobile and connected world (both in terms of people and devices), this number is only bound to get larger. Yet, in the literature we observe that many researchers often unwittingly treat the geospatial dimension as if it were a regular feature dimension, despite it requiring special attention. 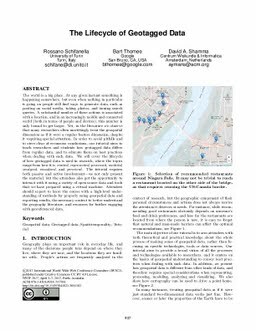 In order to avoid pitfalls and to steer clear of erroneous conclusions, our tutorial aims to teach researchers and students how geotagged data differs from regular data, and to educate them on best practices when dealing with such data. We will cover the lifecycle of how geotagged data is used in research, where the topics range from how it is created, represented, processed, modeled, analyzed, visualized, and perceived. The tutorial requires both passive and active involvement-we not only present the material, but the attendees also get the opportunity to interact with it using a variety of open source data and tools that we have prepared using a virtual machine. Attendees should expect to leave the course with a high-level understanding of methods for properly using geospatial data and reporting results, the necessary context to better understand the geography literature, and resources for further engaging with georeferenced data.